Anthony Westkamper A robber fly in all its ugly glory. Back when cameras used film, I noticed large sections of leaf chewed away on the madrone tree in my front yard. I found three large green caterpillars gnawing away at them. I watched carefully over the next few weeks until they each spun a cocoon. I put a mesh bag over each of them and waited. Sadly, I hadn't tied the mouths of the bags tightly enough to keep out earwigs, which ate the newly emerging moths. Ever since, I've been trying to get a shot at one of the giant silkworm moths, locally known as redwood moths. I've also heard them referred to as gypsy moths, which are completely different creatures. After a recent trip, it was 1:30 a.m. by the time I arrived home and started to unload the car. After 20 years looking for a specimen of the ceanothus moth (Hyalophora euryalus) one was hanging on my window screen. 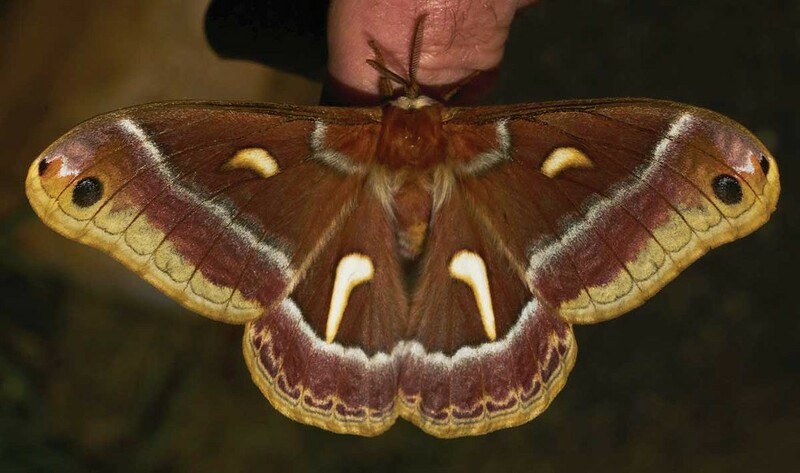 This is the second largest moth in our area after the polyphemus moth, both of which are saturnids or giant silkworm moths. The silk on their cocoons is not commercially useful and the adults cannot feed because they have no mouth parts. As big as bats, they are attracted to lights and are often docile enough to handle gently. After I took a bunch of photos of the one that visited my house, I put it outside in the back yard. In a few minutes I heard something banging on the window. It was trying to get to the light through the glass. I turned off the light and went to bed. Working in the weeds behind my yard I noted a strikingly colored rangeland tiger moth (Platyprepia virginalis). Not as large as the saturnids mentioned above but still big for our area, it is the largest "wooly bear" moth commonly seen in our area. On a recent trip up to central Oregon, at a rest area along the Rogue River there were several giant California stoneflies (Pteronarcys californica). This is the largest species of stonefly in the world. Common along my stretch of the Van Duzen River, I recognized them immediately. They are totally harmless and their presence indicates good water quality. Knowing they're out and about indicates there may be good fishing in an area. A helpful hint: Snapping photos of things others either can't see or don't notice around public restrooms can get you some strange looks. 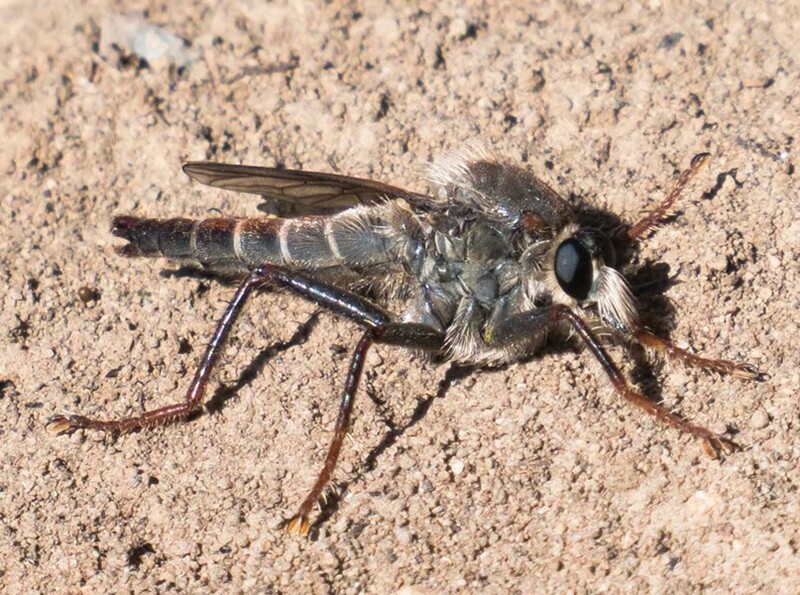 The big robber flies that abound up there — easily an inch and a half long — are the local aerial insect predator. While flying, their wings made a loud, deep buzz. I suspect the presence of a farm with large animals, dung and the creatures attracted to it, drew these ugly hunters. True flies (member of order diptera, family asilidae), these guys can, if mishandled, deliver a painful bite, injecting a cocktail of neurotoxins and digestive enzymes designed to paralyze then liquify their prey's innards to be sipped out through specially evolved mouthparts. I watched as one struggled to fly with prey as large as itself, finally settling among the weeds. At first I thought it might have a cicada, but soon realized it was dining on one of its own. Yes, aside from being hideous, they're cannibals, too. At another rest area in Central Oregon I spotted some gray and black caterpillars as large as my index finger crawling down the trunks of several pine trees. It turns out they are the larvae of the Pandora moth. During heavy infestations, they can denude entire trees or even swaths of trees and have been cited in many references as a Native American foodstuff of note. For more HumBug, visit northcoastjournal.com on Sunday afternoons.